You have CONFIRMED so much! Thank you for obeying the Lords instruction to post your blogs. It truly does encourage and inspire us. Congratulations on making the top 100! Your AWESOME Mike!! Thank you so much for your encouraging words! Hi Debbie! Your blog is really interesting. I have had a few dreams in the past that seem crazy, but I know God was speaking to me, wanting me to dig a little deeper. Your interpretations resonate with me. 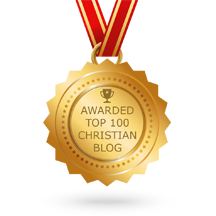 Blessings and congratulations on being awarded the top 100 Christian blog!